Although the above mentioned relate to what we do, we are not necessary limited to these services. As a creative agency, there is a continued effort to benchmark ourselves with current industry leaders. We do this in order to maintain a required standard of service and product delivery. Through constant innovation and a trusted refinement process, we seek to develop ourselves to a level that identifies us as commendable competitors in our field of industry. Imagine your request visually interpreted into the exact shade you dreamt it in. The vision we have certainly pans out much wider than our current functions. We explore briefs and give our best in order to delivery way more than whats expected. We don’t want to impress you like the traditional salesman with a rehearsed sales script. We want to offer you our golden wisdom. We want your business to flourish to its full potential. Having done my first professional photoshoot with Equisite Motivity, was a wonderful experience. Photohoots can be quite intimidating and nerve-wrecking, but with Odirile Seageng that was contrary. He created an exciting and creative environment in which I could be myself. His ability to use different elements allowed me to see art in his photography. I admire his work, and look forward to working with Exquisite Motivity again. Working with Exquisite Motivity has been an awesome experience! Odirile is absolutely brilliant from start to finish, professional, efficient, friendly and truly talented. He is clearly passionate about what he does, the pictures he took for Studio MoMa’s launch came out amazing, thank you so much!! Studio MoMa would definitely recommend Exquisite Motivity to anyone looking for a wonderful photographer. “It has been a pleasure working with you in 2017. And I pray to continue working alongside you for many more to come. Thank you for never shying away from your brilliance. You actually don’t know how many people fear chasing their passion and/or what they were created for. Through your work, you have managed to be a full extension of God’s creative genius. You are so amazing, and I wish you nothing but prosperity, light, growth and joy.” it’s an honour! 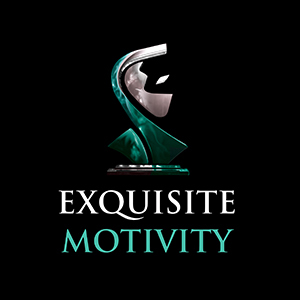 Exquisite Motivity is one of the most reliable, talented and professional organizations I have had the pleasure of working with! It has been a pleasure working with Exquisite motivity in the year 2017. It is not often that one comes across an business that takes time to understand the client and is driven by seeing the success of the business. We at E mania looks forward to working with Exquisite motivity in 2018 as we toasts to another year of successful partnership. The founding of the Au Gold brand was a moment of genius between two budding entrepreneurs, to bring that brand to life required a vision of equal brilliance, in this regard the team at Exquisite Motivity had all the necessary tools to achieve exactly what we were looking for.